Captain Wade Hunnicutt is the wealthiest and most powerful citizen in his Texan town. He is also a notorious womanizer, which has turned his wife Hannah against him. 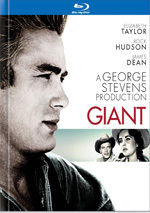 An effort from director Vincente Minelli, 1960’s Home from the Hill introduces us to Captain Wade Hunnicutt (Robert Mitchum), the richest and most powerful member of his east Texas town. He often cheats on his wife Hannah (Eleanor Parker), a factor that leads to their estrangement. Their son Theron (George Hamilton) depends on Hannah, but as he nears manhood, Wade decides he needs a man’s guidance. This leads to a mix of conflicts inside and outside the Hunnicutt family. Man, that’s a vague synopsis, especially given the movie’s length. Hill runs a fairly extended 150 minutes, so my overview doesn’t offer much meat for a film that approaches “epic” status. Unfortunately, Hill doesn’t deliver much substance, either. Essentially just a mopey soap opera, the movie rambles forever and lacks real purpose or heft. Though Wade acts as the ostensible lead, most of the film actually focuses on Theron, especially in regard to his relationship with town cutie Libby Halstead (Luana Patten). We trace Theron’s coming of age/puppy love domains as they develop. These topics could work as the focus of a movie, but they seem like thin gruel for a flick that runs two and a half hours. The characters and situations fail to develop in a particularly compelling way, and we’re left with simple scenes that sputter along for more minutes than they require. Take an early sequence in which local men take advantage of young Theron’s naivete. He goes on a “snipe hunt”, and the movie doesn’t know when to quit, so we watch this aimless sequence expand far beyond its point of purpose. I’m not sure how much better Hill would be at a shorter running time, though. Yes, its extended length exacerbates its flaws, but even a 100-minute Hill would still give us thin characters and dull melodrama. Mitchum offers some intrigue, as he straddles the line between charming and loathsome, but we spend way too much time away from Wade. When Mitchum appears, he brings charisma to the tale, but the film’s preoccupation with Theron’s melodrama leaves us in the mud. Obviously Hill boasts talent behind it, but it can’t overcome the turgid nature of its story and characters. At 150 minutes, the film wears out its welcome well before the end credits roll. 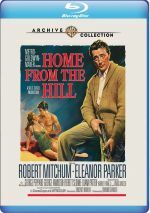 Home from the Hill appears in an aspect ratio of approximately 2.35:1 on this Blu-ray Disc. Across the board, this was a pleasing image. Sharpness was strong. Only minor softness ever appeared, mainly via a few wider elements, so the majority of the film offered positive delineation. I saw no jagged edges and shimmering wasn’t a problem. Source flaws stayed absent, while edge haloes didn’t appear, and with a nice layer of grain, the transfer showed no signs of intrusive noise reduction. Colors appeared appealing. The movie exhibited a fairly earthy palette that remained warm and full. As for the DTS-HD MA 2.0 soundtrack of Hill, it worked just fine given its age and ambitions. Speech consistently appeared intelligible enough, despite a little edginess at times. The score and songs were acceptably lively and full, while effects also showed good clarity. Those elements didn’t pack much of a punch, but they were fairly accurate and tight. The soundscape provided pretty nice stereo presence for the music, and effects spread gently to the side speakers. These elements didn’t show great breadth, but they added some localization and movement to the proceedings. We also got a nice range of directional dialogue at times. This was a better than average mix for an older movie. An attempt at an “epic” family drama, Home from the Hill never goes anywhere. It seems too long, too slow and too shallow. The Blu-ray produces good quality picture and audio but it lacks supplements. Given the talent involved, Hill ends up as a boring disappointment.